Today I have a secret recipe for a healthy side dish served at Cafe Rio Mexican Grill. This cilantro lime quinoa is packed with vibrant flavors that come from combining green chiles, cilantro and fresh lime juice. Quinoa is naturally gluten-free and is loaded with vitamins and nutrients. Eating healthy never tasted so good. In a blender or food processor blend together the green chiles, onion, and cilantro until smooth. Add blended mixture and all remaining ingredients except for the lime juice into a medium saucepan or the pot of your instant pot. Cook on manual for 5 minutes and allow pressure to release naturally. Once pressure is completely released, fluff quinoa and mix in lime juice. Cover and lower heat to a low simmer for 25-30 minutes or until quinoa is fluffy and most liquid has evaporated. Fluff quinoa and mix in lime juice. Today I have a secret recipe for a hearty soup served at Cafe Rio. Their tortilla soup is chock full of wonderful flavors. Shredded all white meat chicken breast, topped with a steaming cup of broth and overflowing with fresh veggies, crunchy tortilla strips, homemade guacamole, Pico de Gallo, and shredded cheese. As a bonus I’ve included the recipe for Cafe Rio’s shredded chicken. In a large pot, saute onion and carrots in olive oil until tender. Stir in cumin and chili powder; saute an additional minute. Add chicken broth, cilantro, lime juice and pepper. Simmer 30 minutes. In individual bowls, layer chicken, a scoop of Pico de Gallo, a scoop of guacamole and shredded cheese. Ladle 1 – 1 1/2 c. of broth directly over layers. Garnish with crunchy tortilla strips, cilantro and lime wedges. Cook all ingredients in a crock pot for 4 hours, shred meat, then cook for an additional hour. Today’s secret recipe (below) is perfect for a weeknight meal. Cafe Rio Mexican Grill is a fast casual restaurant chain that is known for using fresh ingredients and homemade tortillas. 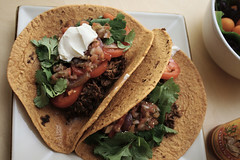 Cafe Rio’s shredded beef tacos are full of flavor and easily prepared in a crockpot. For this recipe you can get all the ingredients ready to go the night before, then just turn on the crockpot in the morning and by the evening dinner will be all ready. Cut the onion into large, chunky slices; place on the bottom of slow-cooker. Place the roast on top of the onions. Combine broth, 1 Tablespoon cumin, garlic and tomato sauce; pour over the top of the roast. Cover and cook on LOW for 6-8 hours. Transfer meat to a cutting board; use two forks to shred the beef. Strain the juices from the slow-cooker, reserving the juice. Transfer shredded meat back to the slow-cooker and pour some of the strained juices over the shredded beef (as much as you prefer). Stir in the enchilada sauce and 1 tablespoon tomato paste. Season with salt and extra cumin, to taste. 2) Get Paid To Eat & Travel!